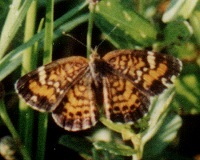 Pearl Crescents (Phyciodes tharos) are true brush-foot butterflies. The term "brush-foot" refers to their shortened front legs. Also called Pearly Crescentspots, they are found throughout the year in open and moist areas statewide though only rarely in the Keys. They fly low and nectar on many composites, milkweed, and other flowers. They usually rest, bask, and feed with wings spread. Adult butterflies are small with a wingspan of 1-1.5". Females have heavier dark markings than males. Pale green eggs are laid in clusters of up to 200 on the underside of aster leaves. The caterpillars are brown with creamy to yellow bands and brown branching spines with white tips. They feed together on the underside of the leaves. The chrysalis is gray to brown and mottled.